You’re probably wondering why the heck anyone would bake pancakes. I get it. They’re pancakes, they belong on a hot griddle, you’re right. 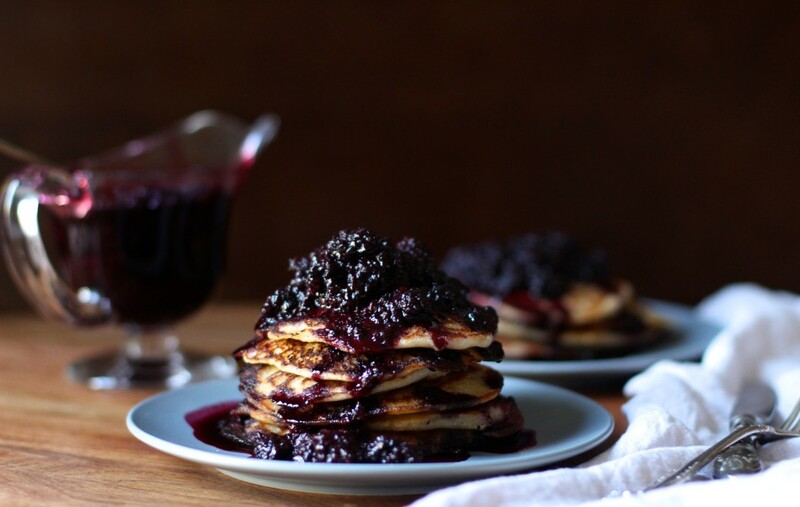 But one morning I got fed up standing over the stove – half asleep – flipping loads of pancakes (we’re a family of six, and five of those humans are guys aka big eaters) so I preheated my oven in a huff after a dozen flips and poured the batter onto baking sheets and the rest was history. To my surprise, they came light and airy with plenty of pancake flavor. Now I’m pretty much hooked (think: lighter silver dollar pancakes, slightly larger). But not all were happy about my little science experiment. There were (and still are) a couple of protesters (I won’t name names) to my baking pancakes who still need to sweet talk me to get griddle style pancakes every now and then because I’m stuck on my shortcut ways for now. Ha. What I love about baking the pancakes is that my boys get involved with measuring skills and pouring little “cakes” onto baking sheets without any high heat griddles or pans to worry about and that they taste like a light lemon cake, without the frosting. Oh and as tempting as it may be to frost this all up, please refrain and go with the blackberry sauce. It is everything and more. Griddle or no griddle. Mother’s Day breakfast or non-Mother’s day breakfast. 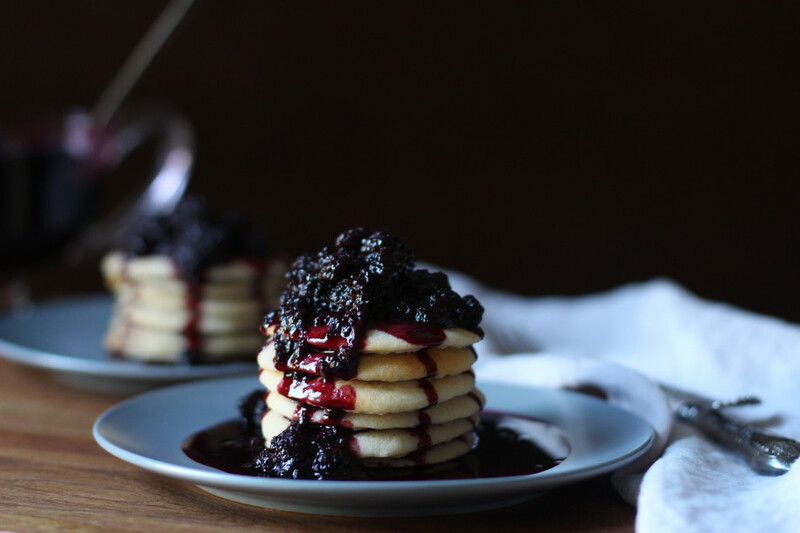 Just don’t make it without the blackberry sauce because there is a deep flavor love here. Frost another time (I know you were thinking that whole frost-to-look-like-a-mini-cake-for-breakfast business, I’ve been there). Psst, know what makes them so light and airy without eggs? Canned Great Northern White Beans liquid, you know, the stuff we usually spill down the drain? It’s magic and whips up like egg whites. Aqua faba (canned chickpea liquid) is what many around the web are using in egg free recipes – something I use often, but ran out of – so I went with what I had on hand: white beans. 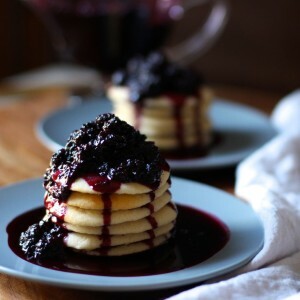 Being that they also have about the same starch level to create soft peaks, giving this carb-filled breakfast some protein and fiber along with a ton of Vitamin C from the berries. Also, I know I wrote “fresh or frozen blackberries” in the recipe, but if you have a Costco or other wholesale retailer near you pick up a big bag of frozen and save the rest for blackberry pie or something. 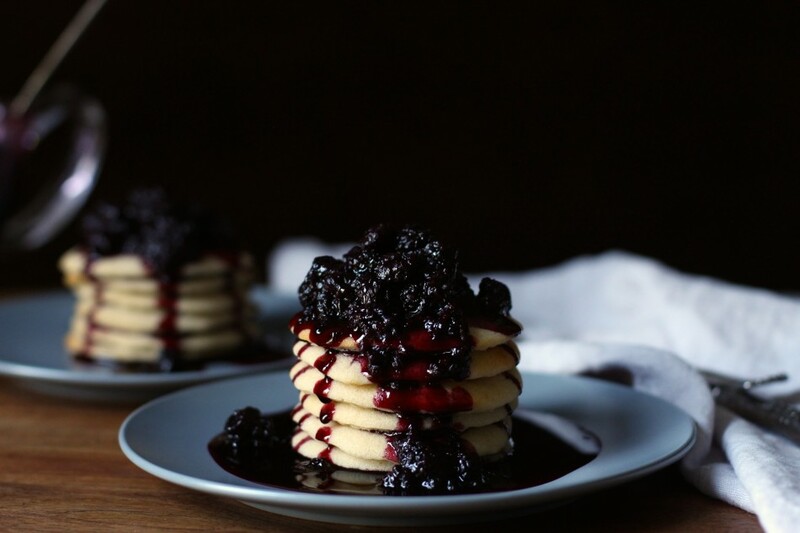 Sweet, tart, and syrupy blackberries need to be piled on excessively over these lemon pancakes so forget about any pancake-to-sauce ratios. It’s the weekend, enjoy. And before I go… to all you Mamas who do what you do – Happy Mother’s Day! Laugh, rest, eat, sleep, drink, whatever your pleasure, just do it and enjoy your day because you’re worth it. Happy weekend friends. You decide - to flip or not to flip. This pancake recipe full of bright citrus flavor can either be prepared on the stove top to taste like pancakes usually do or baked (yes baked!) for a light cake-like texture resembling a mini cake sauced up. 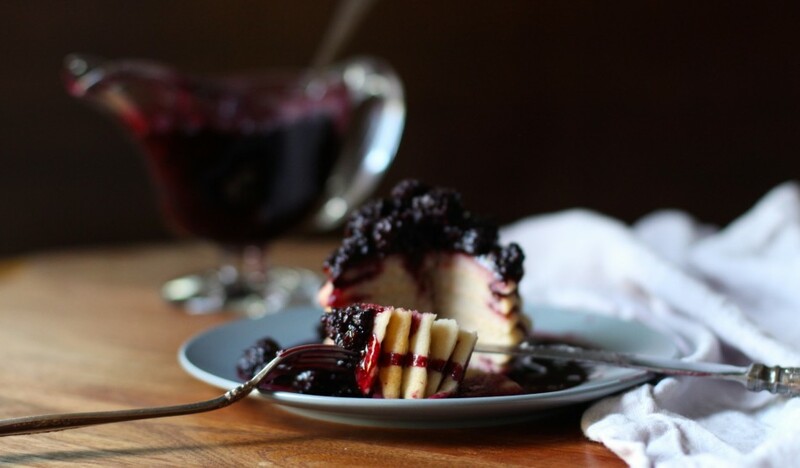 Either way, don't forget the blackberry sauce - it's a must! For Baked Pancakes: Preheat oven to 425 degrees F (218 C). Line 4 rimmed baking sheets with parchment paper. PLEASE NOTE: Cooking time listed above is for griddle style pancakes, oven baked is 15 minutes. Combine all ingredients in a large saucepan then set on medium-high heat. Cook for 60-65 minutes, until liquid has reduced by half and coats the spoon, but not thickened. Set aside. In a stand mixer set with the whisk attachment, combine canned bean liquid and cream of tartar and whisk of medium high for 5-6 minutes then add 2 teaspoons of sugar and raise to high speed for another 5 minutes until soft peaks have formed. There shouldn’t be any remaining liquid at the bottom of the bowl. Meanwhile, during the 10 minutes of whisking: combine coconut milk and lemon juice, set aside (do not stir). Whisk tapioca starch, coconut flour, white rice flour, kosher salt, psyllium husk, and sugar in a large enough bowl to contain remaining ingredients. Add in coconut milk mixture, then mashed banana, and melted non-dairy spread, whisk to combine well. Add in half of the soft-peaked bean mixture to the bowl and gently fold in using a rubber spatula (as if a rowing motion: along the inner edge of the bowl, under, then over and repeat while rotating the bowl in a clockwise motion). Add in remaining peaks and repeat until homogeneous. For cooking on the stove top: Use a large non-stick pan (preferably ceramic because it’s better for you than non-stick aluminum (a neurotoxin)) set on medium high. When hot, add a tablespoon at a time of melted non-dairy spread to coat the pan. Using a dry measuring cup in ⅓ cup size, pour batter into the pan forming a circle. If it spreads out along the edges, push batter in slightly with the spatula for even thickness. Cook 2 minutes then flip and cook another minute until slightly firm in the center. Continue to add non-dairy butter as needed to cook remaining pancakes. Using a dry measuring cup in ¼ cup size, scoop and pour batter onto prepared (parchment lined) baking sheets forming circles. Bake for 13-15 until set and can easily be lifted off the baking sheet. They will not darken or become golden (resembling sugar cookies) since there isn’t any baking soda in the recipe. If you have limited space in the oven: bake 2 sheets, then transfer baked pancakes to an oven safe platter. Bake remaining pancakes and turn off the oven. While the oven is lowering temperature, add remaining baked pancakes to your platter and warm in the oven for a few minutes before serving. 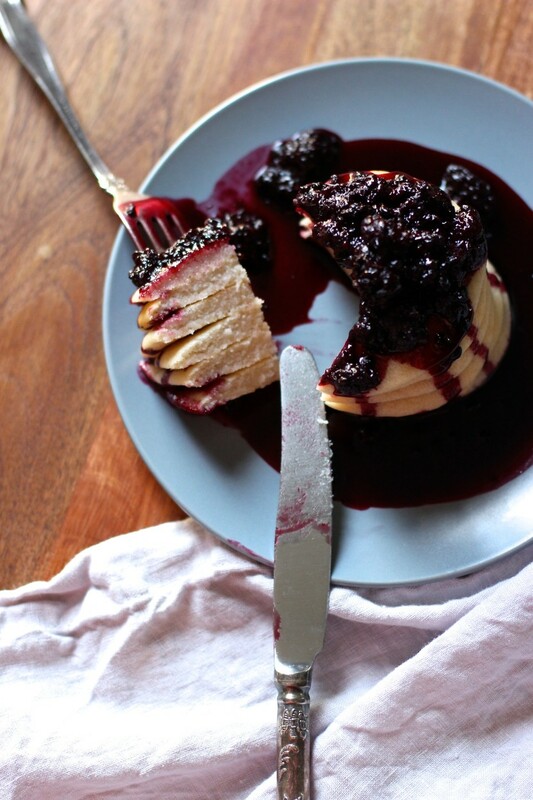 Serve with blackberry sauce. Best eaten the same day. Note on cooking time for blackberry sauce: this does take some time to reduce because I do not add any cornstarch or thickeners, so i make it the day before I'm using it. If there is a rush for time, reduce water by a cup - this should reduce the cooking time by 20 minutes. It also keeps well when made in advance (up to a week, refrigerated). If it thickens up, add a spoon of water then give it a stir. 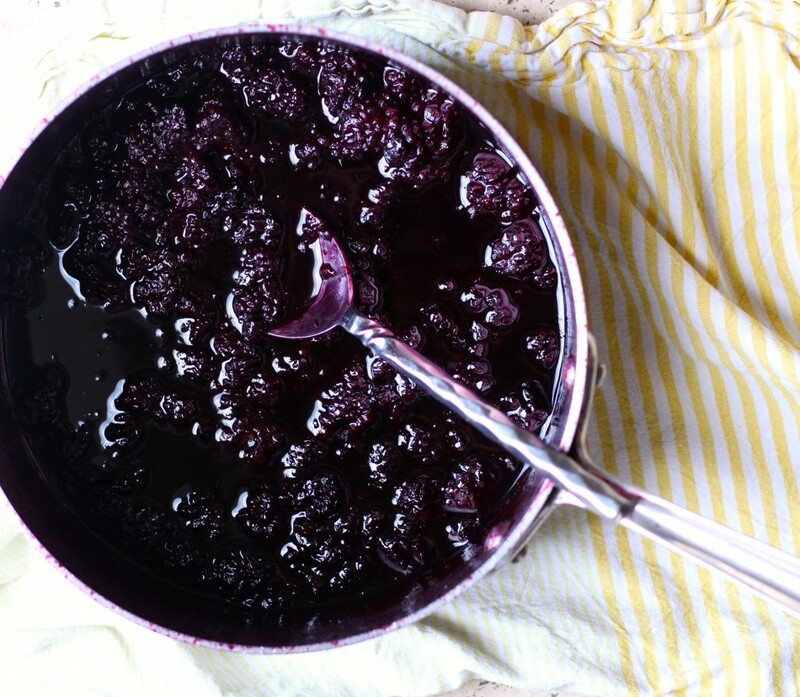 Note on sugar in blackberry sauce: Because blackberries are tart I use more sugar. If using ripe fruit that’s on the sweeter side, reduce the sugar by a third. 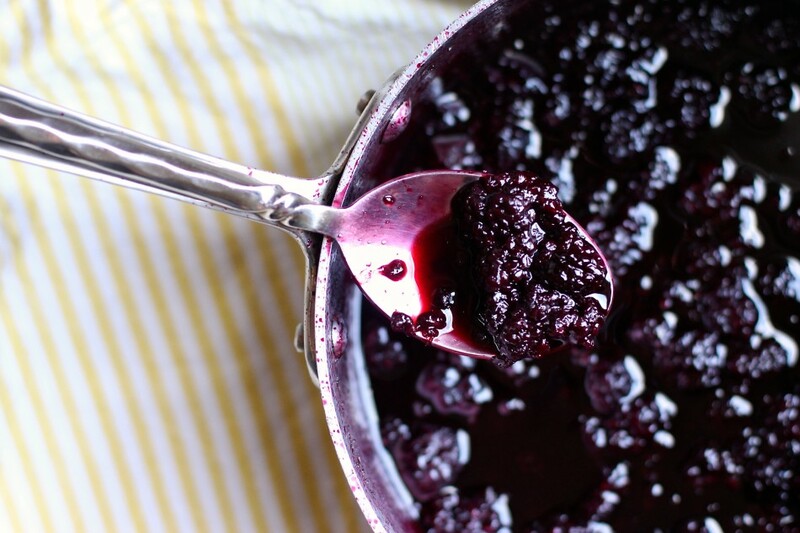 For the blackberry sauce: easily swap out blackberries for other berries or stone fruits (peeled). 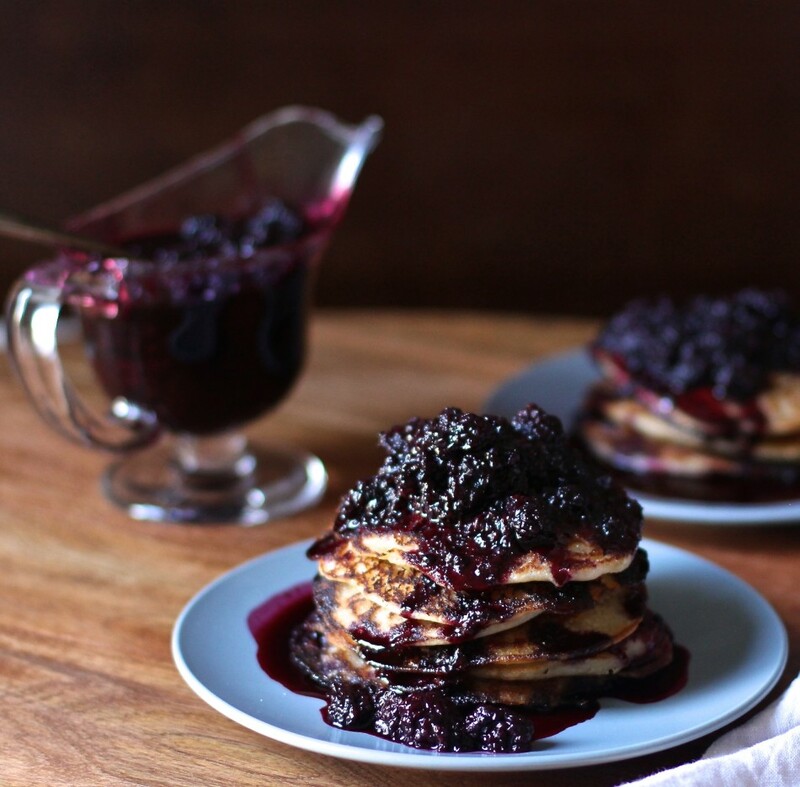 For the pancakes: easily swap out lemon extract for orange extract (pairs well with blueberry or cranberry for the fall), or vanilla extract (pairs well with everything). 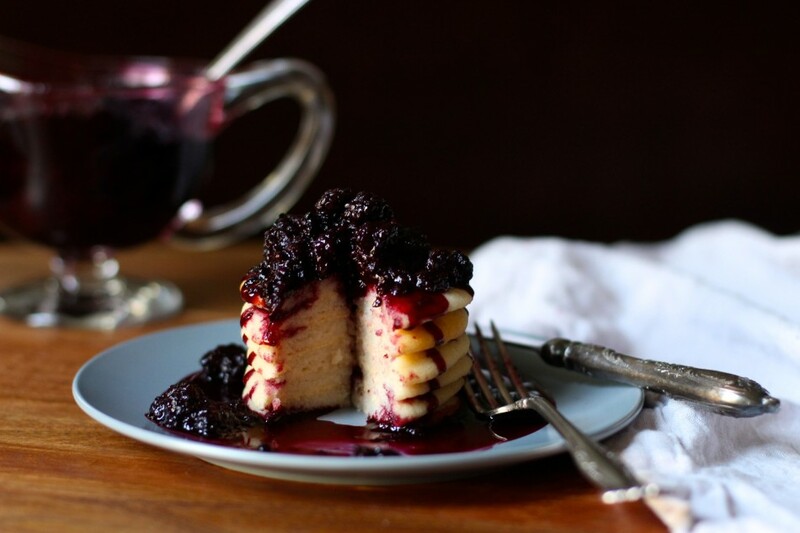 The blackberry sauce is also delicious stirred into oatmeal, porridge, yogurt, waffles, pudding, etc. For freezing: Baked pancakes do very well frozen. Simply place them in a single layer into a gallon-sized freezer-safe bag, then insert one of the parchment papers (you used to bake with) and create another layer of pancakes and repeat. Be sure to push all the air out of the bag before sealing. Lay flat in the freezer. Can remain frozen for three months and bake from frozen at 350 degrees F for 5 minutes in the oven or toaster oven. These pancakes look great. I never use blackberries but that's going to change. Guess what Mom is going to have for breakfast on Sunday. Thanks Jack, you must give it a try. Hope you enjoy and happy weekend! Both look incredible and so inspiring that you use bean liquid instead of eggs. I can't stand the making of pancakes so thank you for your clever approach to making pancakes! Look forward to trying this!! Thanks Lisa, I would have never thought bean liquid, of all things, is what I would use in baking. Hope you enjoy them as much as we do! Gorgeous! Griddled AND baked? Thanks for sharing both! Oh my gosh I want to make this so bad but I'm concerned about all the sugar. Is it really sweet like jam? I saw the note on reducing sugar, but if I reduce half cup will it affect the sauce? Thanks so much Jessica! Reducing sugar can affect the sauce because it acts as a thickener. It doesn't taste like jam, more like a flavored syrup if that helps and tangy from the lemon extract. If you need to cut the sugar to 1/2 cup, I suggest reducing the water too (by a cup). It will thicken up and reduce in less time so keep an eye on it after the 30-minute mark. Hope you enjoy and happy weekend! Me too, until I did some research and tested it out on a few recipes. So happy to hear this recipe works for you and bet your daughter will love it baked if she likes cake. Enjoy! Thanks Rebecca, that's how I felt eating them then had to make more to share here...you must give it a try! Happy weekend! Aw, thanks so much Erin. It's just me looking for shortcuts hehe. You need to give it a try, it's a game changer! Have a great Monday! OMGee does this look stunning. New weekend breakfast plans. Haha YES to new breakfast plans. Enjoy!